CMC firms are constantly engaged in developing new shapes and surfaces, in order to satisfy all the demands regarding the world of stone. All the offered products (floors, coverings, furnishings, bathroom furniture, inlays and elements for the interior and exterior design) are the outcome of technological innovation and research. Through important research projects and studies of new stone creations, developed during the time in partnership with architects and designers, CMC has become a protagonist in the world of contract. CMC Vision is to support ongoing researches and trainings and to create valuable relationships with the main marble suppliers to ensure a complete offer and a customer-driven production. Guided tours and meetings by booking only. The Valley of Chiampo has been specialized in processing stone for more than 100 years. 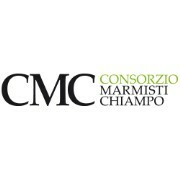 In 2005, some of the local firms gathered to constitute the CMC (Consorzio Marmisti Chiampo). CMC has been created to offer a qualified teamwork at the service of architects and interior designers. CMC firms are constantly engaged in developing new shapes and surfaces, in order to satisfy all the demands regarding the world of stone. CMC promotes a new approach in the processing of stone products that is environmentally sustainable, by using environmentally friendly production processes: this is one of the main subject during seminars, workshops and guided tours CMC organizes during the year for visitors who come for discovering the Valley of Chiampo and its local stone production. With their products, CMC firms contribute to the "green building” because the materials from which their products are made are one-hundred-per-cent natural, and because their production processes use reduced amounts of power in a responsible way. They also completely recycle the processing waters, and responsibly set aside the byproduct for other uses. Hence, they do not produce unused waste. Since its constitution, CMC gave lots of importance to the training, creating different ways of information and updating for both, the staff of affiliated companies, to incentivize the company requalification, and for all the consumers, making easier the approach to the world of the design and of the construction with stone. CMC invests in research and in development: continuous technologic research, in partnership with leading companies in the sector of the cutting and of the manufacturing of the stone, has allowed to come to the creation of new tools and machinery, specifically studied to perform particular demands of originality, requested by the international market. In cooperation with universities, laboratories of analysis, CMC coordinates a continuous research on raw materials, in order to support the planner in the choice of stone materials, suitable to every project, depending on the physical features of every stone. Technologic innovation, design, eco-compatibility and association between different materials and their features, are the focus of which all studies and research of the CMC sustains and concentrates on. Visit the Valley of Chiampo and discover the strength of more than twenty firms which decided to create a network dedicated to the interpretation of the stone, the world of architecture and design, without sacrificing their own specific qualities. Contact us for more information and the terms of the tour booking.